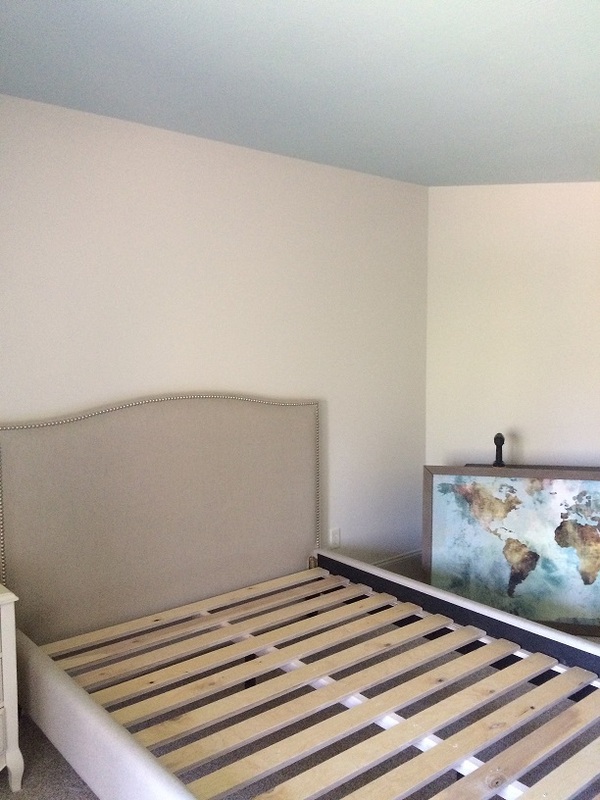 Week 4 of the One Room Challenge and things are moving along, most of the new furniture has arrived, new bedding and accessories, lighting are all waiting their turn for the big installation. There is not much to show for progress this week as the final push begins to get done for the final reveal – so I thought I would talk a bit about inspiration and how that translates into a design plan. My design for her room also has a goal of creating memories for Gianna’s teen years. To refresh your memory of where we started in this room, Check out the “Before” photos in our Week 1 post here. 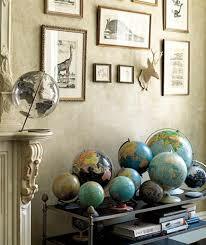 One of the inspirations for the room design was the large world map seen in the room that Gianna said she really loved, and she also mentioned that she was really liking maps of all sorts. Not only did I use the map to give me some color direction, but I also used the map to inspire the idea of travel as a highlight in the room. I started a collection of globes for Gianna’s room to represent her interest in maps and I hope it inspires her to expand her love of maps of all sorts- the ones I used are all reproduction antiques, but there are lots of options to spark an interest in a collection. I hope that this will create a nice memory as she thinks about her room over the years to come – something that she particularly loves could even be a souvenir that she takes to her college room or her first apartment! I enjoyed thinking about her future travels, she and her family have already made several trips to Italy, so I think the travel “bug” is already planted! The art I chose for her room, besides the map idea, highlighted the idea of the quirky things that you might notice as you visit new places. A shop window, a French postbox, a street corner in Paris with a carousel….I hope they all encourage inspiration! 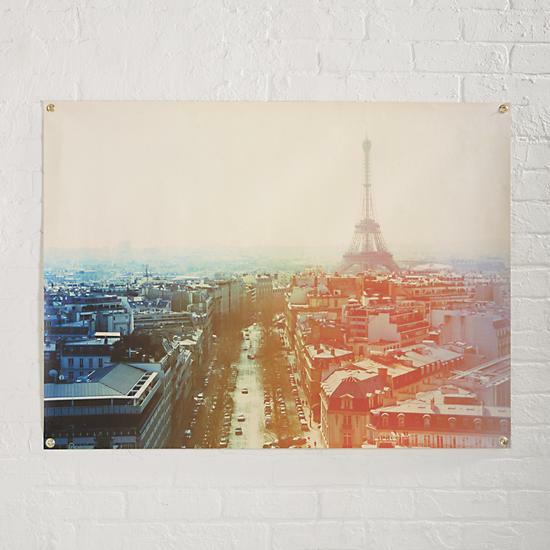 Paris wall banner – lets see if it makes the cut! 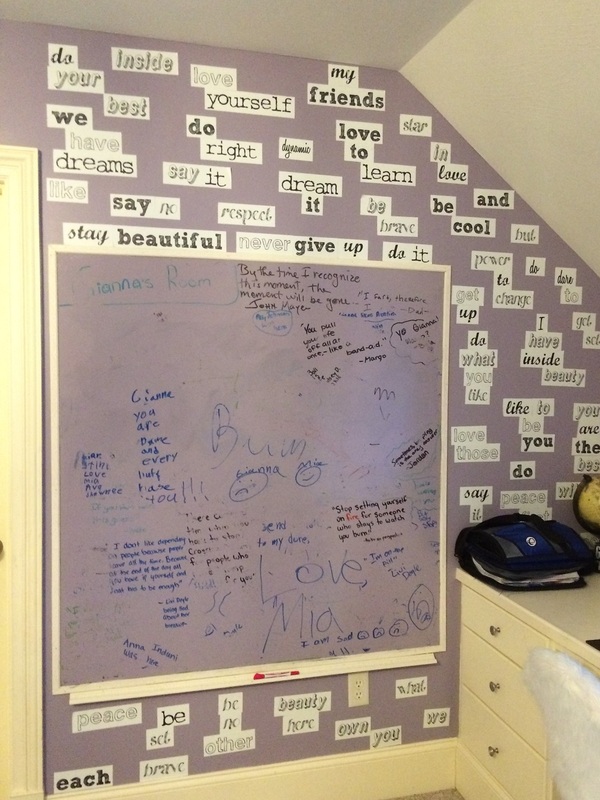 One of the other aspects of the room that I hope will inspire creativity is the Dry Erase wall we created. Gianna already had a small section of her wall near her desk done for Dry Erase markers, but I wanted to expand it and give her a little more freedom to really “go for it”! To remove the “boundaries” so to speak – we took away the molding and did this whole section of wall…we will show a view of this corner next week. Whenever I have the opportunity to design a young person’s bedroom or personal space, I feel it is so much more that just paint or wallpaper, colors or fabrics. I want the rooms I do to be interesting and highlight particular passions, such as a sports team or activity, but I also want to create a space where they can dream about the future and who they might become….to leave room for NEW interests or uncharted directions. I am hoping that Gianna feels that we have created a room that she will love now, but will inspire her as she goes through her teen years. Create new collections, create memories that she will look back on and will remind her of time with friends, travels with her family, basketball triumphs, bycycle tours…..you name it….it will all be part of the unique experience of her days to come! Come back and visit next week and see it all going on as we head to the final reveal!! Any comments and encouragement greatly appreciated….you can also see things along the way at my Instagram page @mlbinteriors.